Your order will ship MONDAY if placed in the next 3 hours 1 minute . Enter your shipping address zip code to receive an instant delivery date estimate from UPS. Federal Game-Shok Field Load 16 Gauge Ammo 2-3/4" 1 oz #7-1/2 Shot for sale online at cheap discount prices with free shipping available on bulk 16 Gauge ammunition only at our online store TargetSportsUSA.com. Target Sports USA carries the entire line of Federal Game-Shok ammunition for sale online with free shipping on bulk ammo including this Federal Game-Shok Field Load 16 Gauge Ammo 2-3/4" 1 oz #7-1/2 Shot. 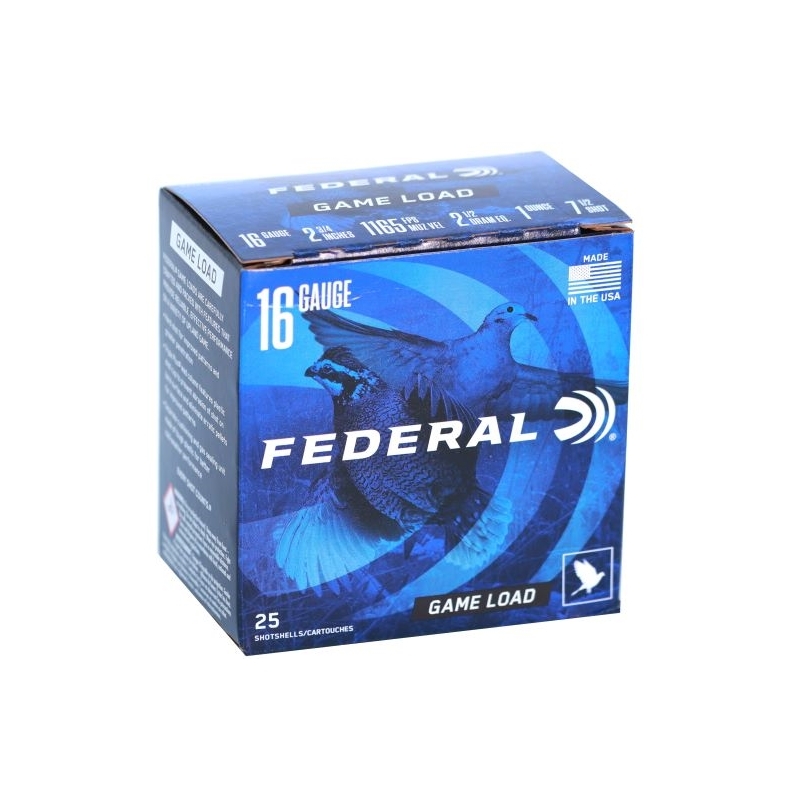 Federal Game-Shok Field Load 16 Gauge Ammo 2-3/4" 1 oz #7-1/2 Shot review offers the following information; For nearly a century Federal Ammunition has put its focus on manufacturing quality products with cutting edge technology. This dedication to excellence has given Federal a competitive edge as an ammunition technology giant. Today the company is well known for producing high grade centerfire, rimfire, and shotshell ammunition that shooters everywhere know and trust. The 16 Gauge Game-Shok Load from Federal features a 1oz #7-1/2 round measuring 2 ¾”. This ammo is non-corrosive and is made with boxer primer and is reloadable for those high volume shooters who love to reload their 16 gauge ammo. Game-Shok 16 Gauge is meant to be a smooth bore round, and makes a great choice for hunting small game. 16 Gauge Game-Shok is a hard-hitting round that provides consistency and dependability round after round while hunting any small game. Load up with Game-Shok 16 Gauge ammo for your next hunt and see why Federal is one of the top names in hunting ammunition. This Game-Shok ammo offers a muzzle velocity of 1165 feet per second. Game-Shok ammo is packaged in boxes of 25 rounds and cases of 250 rounds. Free shipping is available on bulk case orders of this Federal Game-Shok Field Load 16 Gauge ammunition. This ammo is non-corrosive and is made with boxer primer and brass cases and is reloadable for those high volume shooters who love to reload their 16 gauge ammo. Game-Shok 16 Gauge is meant to be a smooth bore round, and makes a great choice for hunting small game. 16 Gauge Game-Shok is a hard-hitting round that provides consistency and dependability round after round while hunting any small game.